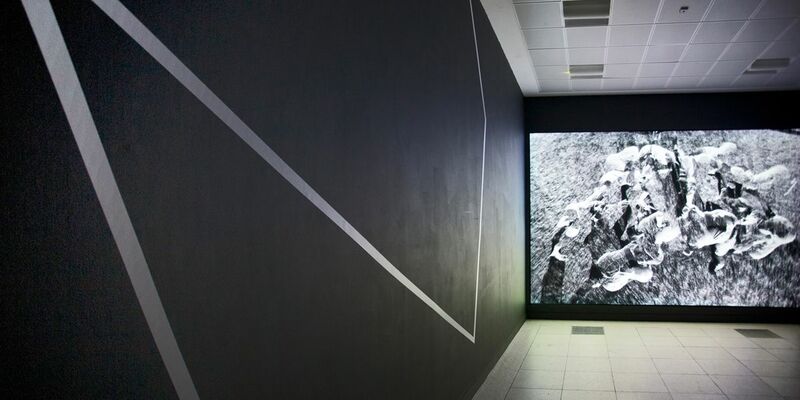 'The Gain Line' is a moving-image art work by Ravi Deepres, commissioned to coincide with the Rugby World Cup. The title of The Gain Line refers to an invisible line on the rugby field that measures teams’ forward progress and their territorial advantage over their opponents. throwing their bodies into the fray to surpass it, and putting their bodies on the line to protect it, players attach inordinate importance to getting beyond this symbolic threshold on the pitch. Beneath the high-impact challenges that take place along this notional frontline, there is another ‘gain line’ players and coaches aspire to reach – one that parallels the rush of competing players with a swarm of chaotic, sometimes conflicting data, captured by a new generation of sensors that players wear in training, and in matches. Although rugby is a visceral, physical sport (‘no pain, no gain’ its philosophical mantra) it is also one that increasingly monitors and mobilises a range of sophisticated technological data, including GPS, heart rate and other readings. Sifted to help coaches gain a competitive advantage, this mass of information may also give us a better understanding of various biomedical/physiological forces at work within the body, offering greater insights into sporting performance, stamina/fitness and injury prevention, not just in elite sportspeople, but in the wider populace. Utilising new technology such as mini-cams, drones mapping player movement, and groundbreaking 3D laser scanning, The Gain Line takes the viewer into the mind-set of the player, both psychologically, physically, and virtually. Ravi Deepres, an artist, filmmaker and photographer, has established an international reputation for his still and moving image work. He has exhibited across the UK and abroad, and his work has been commissioned by the Royal Opera House, Tokyo New National Theatre and the Paris Opera House. With thanks to Premiership Rugby, APR Services and Extreme Facilities. Commissioned by Film and Video Umbrella in partnership with Phoenix, Rugby Art Gallery and Museum and ICIA Bath.